Welcome to the Kazooka Online Store. Secure checkout. Use any major credit card or your paypal account. Kazooka professional membranes are made from durable, long lasting, organic materials. Our membranes sound much better than the plastic and wax paper membranes that come in other kazoos. Our membranes last a least 10 times longer between changes than traditional wax paper membranes and give a more detailed response. Every time you play a wax paper membrane it sounds a little worse. Our membranes sound good for so long that one box should be a lifetime supply for most people. Plastic membranes last for a long time but they are not naturally resonant. They sound harsh and raspy. Plastic membranes will only work within a limited range of pitch and volume, inhibiting your possibilities for expression. Plastic and wax paper membranes collect vapors from your breath and form water droplets on the membrane. Kazoos with these types of membranes sound bad within a few minutes and must be allowed to dry for several minutes before a usable tone can be achieved again. Kazooka membranes are less sensitive to moisture. This allows you to play longer before having to put the kazoo down to dry out. Fits current Kazooka and Hohner models. *Jewel box contains a small zip lock bag with 20 membranes. 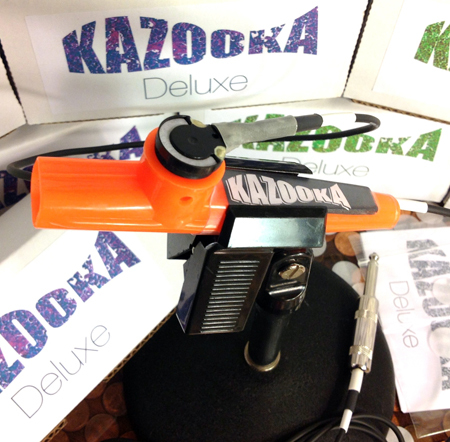 The Kazooka Professional Kazoo has all of the thick, rich, harmonically vibrant tone of the Kazooka Deluxe but no pickup. Features an anti-slip rubber grip so it won't slip out of sweat stage hands. Holds well in most microphone clips. Our caps come off! The caps on similar looking kazoos do not come off! Our kazoos are NOT CHILDPROOF. These are for MUSICIANS, not a toy. The caps come off so the membrane can be replaced or repositioned. This is a choking hazard for children. Do not give these to children. 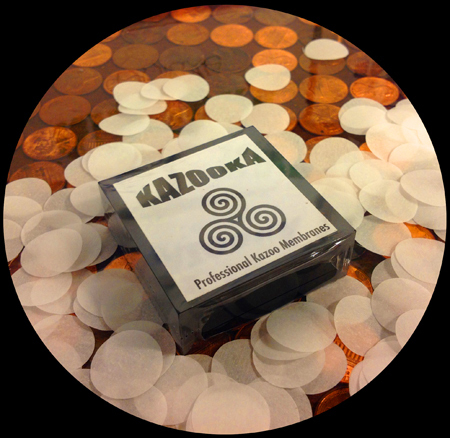 Includes 5 of our Kazooka Professional membranes.